It's amazing to think I've been in the computer field since 1967. What changes! When I started programming, we lined up to use the card punch machines. And it was horribly frustating if your only run of the day was bolixed up because some operator had dropped your card deck, picked it up, and run it in its new random order. Instead of counting color cars on long trips, we'd find cars with license plates that matched computer assembly language instructions. "Hey, ZAP!" "Zero and add packed" for those of you who never had three letter instruction codes burned into your soul. 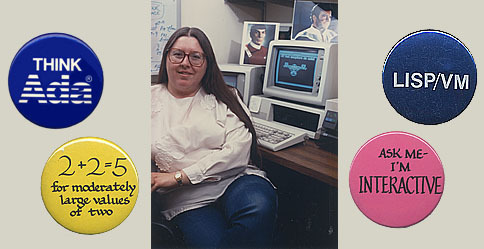 Intermetrics was a company deeply involved in the design of computer languages for the military and NASA. It was a young and exciting place during my years there, and it was natural that we would be deeply interested in the growing drive to understand what the military would need in a common Department of Defense language. Dave Fisher was responsible for the series of requirements documents that culminated in the hardening versions, Strawman through Steelman, that were the basis for the DoD language competitions. I can only think myself lucky to have been on the Intermetrics team competing to design the military's common language. Admittedly, we came in second and, while winning would have been fun, just being part of that whole experience was magic. The good people we met and the work we did... Well, you just can't ask a lot more out of life. 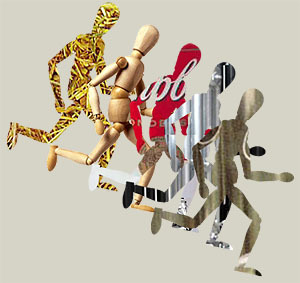 During the two phases of the contest, Intermetrics created two entirely different languages - REDL and RED. 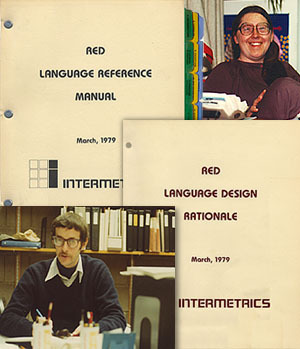 I was only peripherally involved in REDL, but I co-wrote the Reference Manual for Red. We used syntax diagrams to define our language constructs, a technique of which I'd become quite fond while writing the Navy's signal processing language reference (SPL/I). Ben Brosgol, our project leader, was mainly responsible for REDL, and also wrote the Rationale document for RED. 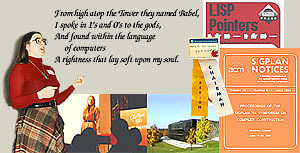 When the contest ended, it was important to fully support the winning Green language, which eventually became Ada. To that goal, RED had to disappear. And it did. But it's been 30 years since RED came out, and it seems there is at least some historical value in making the Red Reference Manual available today. The index to this subsite is hand-built, and covers all the requirements documents, the Reference and the Rationale. Memories Time/Life book SIGPLAN "Types in Red"
It's often joked that Lisp isn't a computer language. Rather, it's a religion. At least that's how I knew about Lisp from my husband Paul, a passionate advocate for the language. I never expected to join the congregation but somehow found myself at IBM Research working in the Lisp/VM group. Looking from the inside out, I have to say that Paul showed exceptionally good taste. But even more than the language, what I truly loved were the members of that small, but remarkable, group. Mark Wegman, Martin Mikelsons, and Cyril Alberga. What absolutely incredible people. That's really the nicest thing about putting up memories on the web - remembering good people. Having moved away from Ada professionally, it seemed inevitable that I'd become more involved with the Lisp community. Since I'd already started one publication - Ada LETTERS - it seemed time to start another. 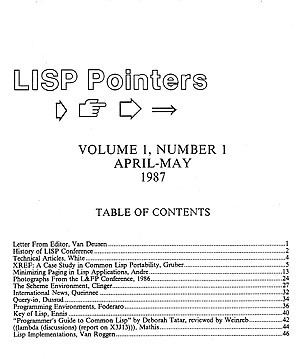 At the 1986 Lisp conference in Boston, I spoke with Lisp implementors and designers, and agreed to edit a Lisp newsletter, Lisp Pointers, with a team of departments that would, like Ada LETTERS, begin by soliciting contributions from companies. Our first issue came out in April of 1987. 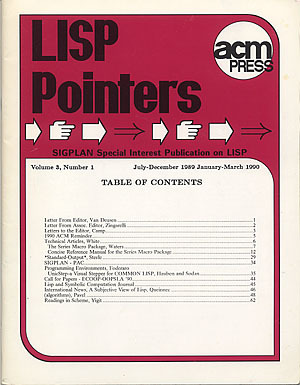 In 1989 we brought the magazine under the sponsorship of ACM's SIGPLAN group as SIGPLAN's first publication without an associated technical committee. I also have Lisp to thank for convincing me to get onto an airplane for, hopefully, the last time. As Secretary of the Common Lisp group, I really HAD to get to the Kauai meeting. That meant taking the train to California, and flying from there to Hawaii. Terrifying, but wonderful. Deep thanks, Lisp. You've given me the most amazing memories. Having developed a love of video editing in my personal life, I was able to convince Abe Peled, an IBM Research Vice-President, to let me out of computer languages and into something more fun. That turned out to be an international, multimedia magazine that I developed to show off the people and projects around our various research labs. My husband followed me, and built a half million dollar studio around my project. You can't even imagine how much fun I had in those years. When I came out of IBM Research on early retirement, I continued making videos about computer topics from home, so we had the fun of building up a production and editing suite for ourselves. And when Paul decided he wanted to travel the states in a 37' long RV, his bribe to me was to create a digital editing suite to travel with us. Doesn't everyone travel with a large light kit under their bed? Now that we're finally finishing up the library at the end of the addition, Paul is upgrading me again to a new editing setup. Can't wait to see how it works out. Fingers crossed. Well, toes really. It's too hard to edit with your fingers crossed. 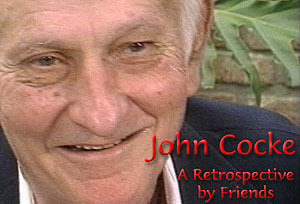 John Cocke was the dearest man, as well as one of the shining lights of IBM Research. With his health deteriorating, everyone was anxious to let John know how much they cared, as well as tell people about John and his work on Stretch, ACS, and the RISC architecture. Our job was to create a multimedia kiosk that would sit in the lobby, and a video that would be shown at the banquet in John's honor. A year or so later, I upgraded the video to include Bush presenting John with the Medal of Technology. And I was later asked to make a version for the Computer History Museum. You've probably already noticed that there's a lot of variety within my site. Some of that is normal for a website of many thousands of pages constructed over 16 years. But part of it is quite purposeful. Experimentation is always the name of my game. I wanted to see if I could build a static version of the original video that would keep much of the beauty of the original. You'll have to decide if I succeeded. I have the space, the bandwidth and the patience, so I've been putting up some of my favorite books. Mostly they were experiments in simple navigation. An 1802 book on how to use the electricity you've captured with your lightning rod to cure gout, and everything else. An agented book that I wrote on Henry Livingston as the author of "Night Before Christmas." But then I decided to put up a book that had been a childhood favorite. Turn of the 20th century academic nudes! Bless mother. Art books usually don't have the pictures and descriptions on the same page, which means using lots of fingers as bookmarks. It seemed I might be able to do better. Paging through the book online had little advantage over holding the book in your hand. The chapter by chapter version was much better. Since the pictures are right alongside their descriptions, no fingers are needed. I also added a third view that sorted the text of the book alphabetically by artist. For this particular book, that technique worked. And if you didn't have much time, I modified the artist view to a pictures view of my favorites. As part of a Christmas celebration at Locust Grove, a museum for Samuel Finley Breese Morse on the property that once belonged to his wife's grandfather, Henry Livingston, my husband, Paul Kosinski, and I created a kiosk display of the life of Henry Livingston. For the museum, we were able to show the entirety of documents mainly belonging to Henry descendant Steve Thomas. The attract screen was a thing of pure beauty. 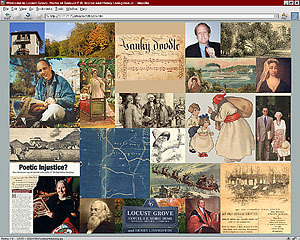 The Henry Livingston website, which is part of my site, is a cut back version of that kiosk.